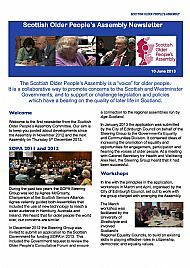 The December 2013 Newsletter covers aspect of the Assembly delivered in December. 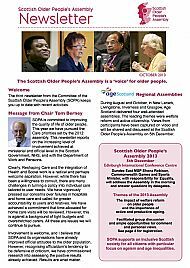 The October 2013 newsletter highlights involvememt with the Crossparty Group on Older People, Age and Ageing, and developing links to the Reshaping Care Agenda. 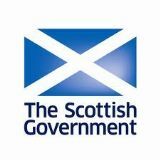 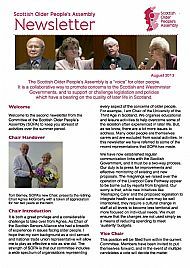 The August 2013 newsletter covers the change of Chair person at SOPA and the involvement with COSLA and the Joint Improvement Team. 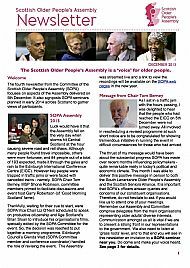 The first newsletter in June 2013 described the workshops undertaken by the SOPA Committee to assess the way forward, and how to best achieve its objectives.